All DTE classes provide balance, breath work and modifications that allow you to make the experience and the postures your own. Each class ends with the final relaxation pose, savasana. Beginners Yoga Weekly Program: Delve into the basics of a yoga practice. This is a exploration into pranayama, meditation and yogic philosophy. This yoga class will examine the principles of proper alignment,breathing techniques,and working to finding the edge. Various yogic philosophies will be discussed as a way to enhance the student’s personal practice. Many styles of Hatha yoga including Vinyasa,Restorative or Yin may be included each week. Foundations: In a relaxing atmosphere, students will learn the benefits of yoga,incorporating basic yoga asana (postures) proper yogic breathing, and relaxation techniques. This is an excellent introduction for new students and also great for the intermediate or experienced student looking to fine tune their practice. Gentle Yoga: A calming ,stress relieving yoga class to stretch and strengthen the body gradually. Emphasis is on building awareness of the breath and the body. Asanas (postures) are practiced at a slower pace with attention to alignment and detail. Props are encouraged to allow the body to fully achieve each pose comfortably. This is a great class for students looking for a more gentle experience,those who are new to yoga or those who need a change of pace. Gentle Yoga with Lymphatic stimulation: The Lymphatic system is the bodies first line of defense against diseases and inflammation. Combining gentle movements with yoga poses and breath work you will stimulate the Lymphatic fluids, promoting toxic cleansing and an overall feeling of well being. This class will include Meditation & Relaxation. Hatha Yoga: The most widely practiced form of yoga in America. Hatha concentrates on physical health and well being. This class offers the student to connect with postures (Asanas), breathing techniques and meditation to create a healthy body and clear ,peaceful mind. THIS IS A DONATION BASED CLASS OF $5 to $10 per class (cash Only Please) all donations will be collected, and Joel will pick an organization here locally to donate to! “Laughter is the best medicine.” Laughter Yoga is based on the scientific fact that your body cannot tell the difference between simulated laughter and humor-based laughter. If you laugh willingly you get the same health benefits. We combine laughter exercises with yoga breathing. This brings more oxygen into the body making us feel healthier and more energized. No Jokes — No Kidding! Sense of humor not required. Yoga I: A gentle approach that allows the newer student to further develop their practice. This class includes foundational postures, pranayama, stretching, balance and relaxation. This practice can also be beneficial to those who already are quite fit but who lack overall flexibility. This class will provide balance, pranayama, and modifications that allow you to make the postures your own experience. Restorative Yoga: Restorative yoga is a deeply nourishing practice that invites the use of props,such as bolsters and blankets to encourage a deep letting go into each posture. Postures are held upwards of 10-15 minuets,offering the benefits of deep relaxation,breath awareness and release of unconscious holding patterns. This practice offers a tremendously healing space to explore the vast realms of consciousness accessed through deep relaxation. Slow Flow Exploration : A flowing class emphasizing slow graceful movements,deep stretches,balancing postures and deep relaxation. Take time for your self to slow down, open your body breath and find inner peace. Sunrise Yoga : This class awakens and warms the entire body, soften the muscles, open the joints, and stimulate the neurological, circulatory and subtle energetic pathways initiating conscious awareness and synchronization of movement in the breath, body, mind, and spirit. 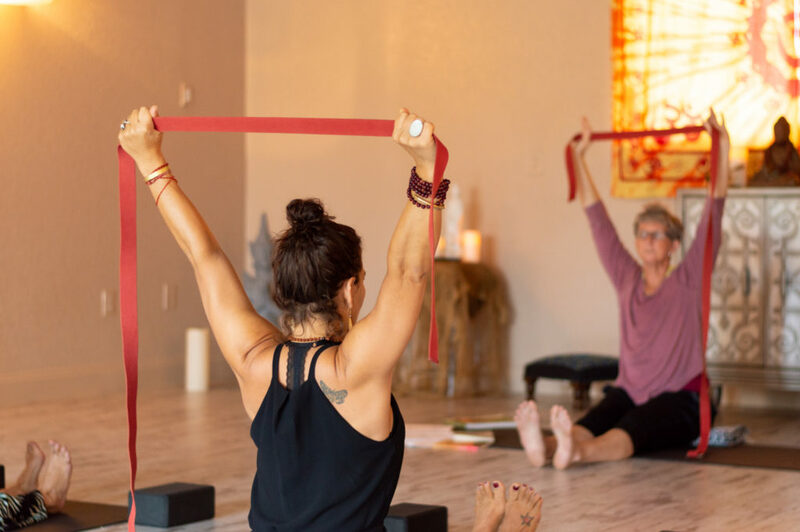 Yin: This class uses gravity,time and body weight to strengthen and lengthen connective tissue,tendons,fascia and ligaments in order to increase circulation in the joints and improve flexibility.